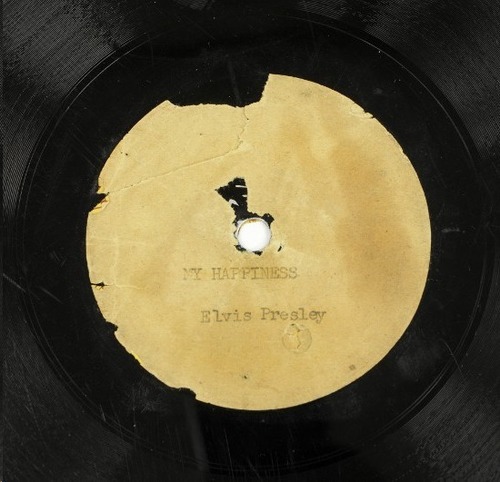 "My Happiness" "That's When Your Heartaches Begin"
This unique record is the "Holy Grail of artifacts in rock 'n' roll history". (Side B) "That's When Your Heartaches Begin"
Elvis then had to take the record to friend Ed Leek's house to listen to it, as his own family didn't have a record player. He became so excited at hearing his own singing voice recorded for the first time, he left the record at Leeks home and completely forgot to give it to his mother. At the time, the winning remained anonymous, but in a new interview for Billboard, Jack White (Third Man Records) has outed himself as the vinyl’s proud new owner. Third Man Records has officially announced the release of “My Happiness” & “That’s When Your Heartaches Begin” for Record Store Day, April 18th. The limited release will be as exact a replica as possible, from running ay 78rpm to precise reproductions of the typewritten labels, which were originally “printed on the reverse of extra Prisonaires labels that happened to be laying around Sun Records in July 1953.” Even the sleeves will be era-appropriately plain.